Stir together first 3 ingredients in a 5-1/2 qt. slow cooker. Sprinkle roast evenly with flour, salt, and pepper. 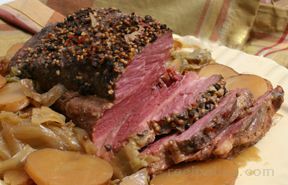 Brown roast on all sides in hot oil in a large Dutch oven over medium-high heat. Transfer roast to slow cooker. Cover and cook on low for 8 hours. 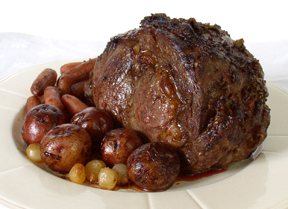 Remove roast from slow cooker; slice to serve. 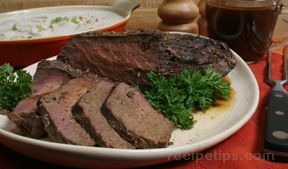 Skim fat from gravy in slow cooker, if desired. Whisk gravy; serve over roast.